Delaware Space Grant supported students Christine Gregg, 2012 NASA Ames Research Center student intern from UD's Department of Mechanical Engineering; Peter Attia, 2012-13 Undergraduate Tuition Award recipient from UD's Department of Chemical and Biomedical Engineering; and Amy Quach, 2012-13 Undergraduate Tuition Award recipient, also from the Department of Chemical and Biomedical Engineering. Delaware Space Grant supported student Danielle Haulsee, 2012-13 Graduate Fellow from UD's School of Marine Science and Policy, makes a presentation during the symposium. 10:27 a.m., April 26, 2013--The Delaware Space Grant Consortium (DESGC), of which the University of Delaware is an affiliate, held its annual symposium April 12 to highlight research work that has occurred as a result of funding support from the NASA Space Grant program. 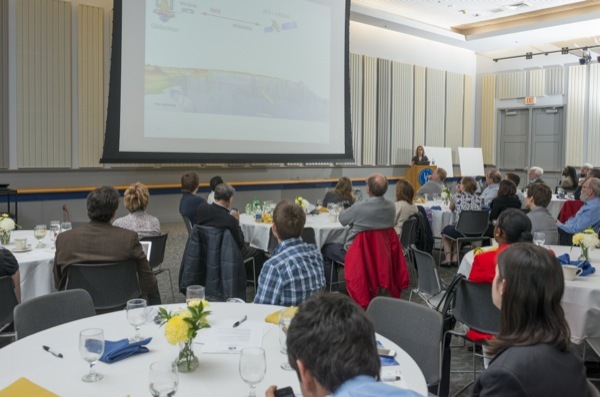 Sixty people attended the symposium, at which graduate fellows and undergraduate research interns presented results, either orally or by poster, of the work they have performed under Space Grant auspices during the past year. Reports were presented by Chandran R. Sabanayagam, associate scientist at Delaware Biotechnology Institute (DBI) and DESGC Research Infrastructure recipient and by graduate fellows from UD’s Department of Mechanical Engineering, Department of Physics and Astronomy and School of Marine Science and Policy, and from Delaware State University’s Optics Department. A report also was presented by an undergraduate team from Delaware Technical Community College that participated in NASA’s Reduced Gravity Education Flight Program. NASA’s Space Grant program was started by congressional mandate in 1989 in order to ensure that NASA would continue to have access to a well-trained workforce of U.S. citizens in the areas of interest to the agency’s missions. These areas include science, technology, engineering, mathematics -- the so-called STEM fields -- and geography. Each year since 1989, Congress has appropriated up to $40 million per year to NASA to administer the national Space Grant program. Within each state, a consortium of colleges, universities and industrial partners collaborate to award fellowships, scholarships and internships to deserving graduate and undergraduate students in the STEM areas. Space Grant funds are also used for in-service training of pre-college STEM teachers. In Delaware, the consortium includes the following academic affiliates: University of Delaware, Delaware State University, all four campuses of Delaware Technical Community College, Wilmington University and Wesley College. 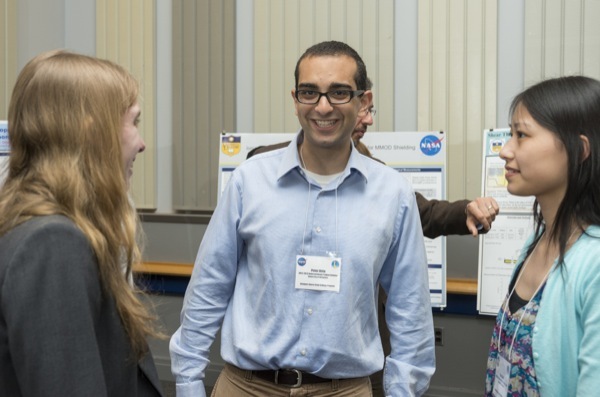 Summer research internships, up to $3,500 on campus and up to $6,000 at a NASA Center. During the current year, consortium funds are supporting eight graduate fellows, 16 undergraduate tuition scholars, and 10 undergraduate summer researchers. Announcements of opportunities for fellowships, scholarships, and internships are made in January-April each year. Information about Space Grant opportunities is available at the Delaware consortium website and the Facebook page, and informational flyers are also circulated throughout the state via an affiliate representative on each campus. On the UD campus, information can be obtained from faculty members in the colleges of Engineering (Bingqing Wei, mechanical engineering); Earth, Ocean, and Environment (Xiao-Hai Yan); and Arts and Sciences (Tracy DeLiberty, geography; William H. Matthaeus, Michael A. Shay and Harry L. Shipman, physics and astronomy). For further information about NASA’s Space Grant program in the state of Delaware, contact Cathy Cathell in the consortium office, Room 212 Sharp Laboratory on the UD campus, telephone 302-831-1094.